Thank you to everyone who visited our stand at the Be Curious event on Saturday 25th March! It was a great turn out with many people enjoying our ‘health checks’ which involved finding out their body composition, blood pressure, height and weight. 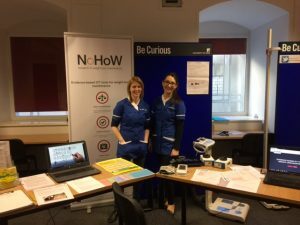 We enjoyed explaining all about the NoHoW project to you all and emphasising the importance of research into helping people maintenance their weight in the long-term. We hope everyone found the event interesting and informative!